(Note: A version of this post appeared on my personal blog, Eat with Pleasure, in January 2014). I first tried Georgian khachapuri (bread stuffed with salty melted cheese) in Moscow, where I found it at a street stand on a frigid, grimy morning in March. Fresh from the oven, it warmed my hands through my gloves and the molten cheese and buttery dough seemed to start insulating me from the cold almost as soon as I swallowed the first bite. From then on, I became a regular, at least until I stopped being able to fit comfortably into my jeans and had to take a temporary hiatus. 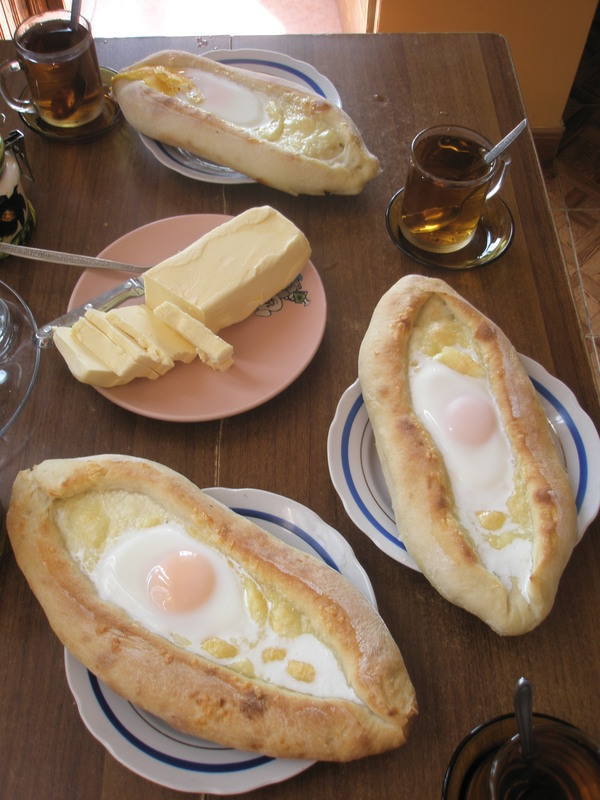 Khachapuri is arguably Georgia’s most celebrated national dish and one of its most recognizable cultural exports, at least among the countries of the former Soviet Union. The sort I’d tried in Moscow is known as penovani, the most popular street snack variety from Ukraine to Tajikistan. It substitutes puff pastry for the more traditional bread dough and comes apportioned for one. There are also several regional varieties: the classic imeruli (a flat, round pie stuffed with cheese, from the central region of Imereti), megruli (pretty much the same as imeruli, but topped with an extra layer of cheese, from the western Megruli region), and the decadent ajaruli khachapuri, which hails from the Ajara region on the Black Sea coast. January, however, is another story. There’s nothing like biting cold (or a nasty hangover) to make you crave stick-to-your-bones food like this. Make it for a weekend brunch or your next snow day. It’s so filling you won’t need much on the side: just coffee and some grapefruit or orange juice to cut the richness. In a large bowl, combine the yeast, sugar, and warmed milk. Let stand for 5-10 minutes, until the mixture becomes foamy. Add the melted butter, egg, flour, and salt and mix well to form a soft dough. (You’ll probably need to use your hands at the end to get everything thoroughly mixed.) The dough will still be fairly sticky but should pull away from the sides of the bowl. Turn the dough out onto a lightly floured surface and knead 2-3 minutes, adding only enough flour to keep it from sticking. Roll the dough into a ball and put it in a large buttered bowl, turning to coat. Cover the bowl with a towel and set it in a warm place to rise until roughly doubled in size, about 1 ½ hours. Thirty minutes before you plan to bake the khachapuri, preheat the oven to 450 degrees F. Line two heavy-duty baking sheets with parchment paper or aluminum foil. Roll the edges inward loosely to create an “eye” shape roughly 7-8 inches long and 4-5 inches wide in the middle. The rolled dough around the edges should be about 1 inch high. Twist the edges together at the ends (the corners of the eye) and press the twist down with your thumb to “seal” them. Transfer each khachapuri to the lined baking sheets and let them rest about 10 minutes. Meanwhile, mix the cheeses, yogurt, beaten eggs and salt together in a small bowl with a fork. Once the dough has rested, spoon some of the filling into each one (enough to fill them but not so high that it might overflow in the oven). Beat 1 whole egg with 1 tsp. water to make an egg wash. Use a small brush to coat the sides of each khachapuri generously with it. Bake for 12-17 minutes, until the crusts begin to turn golden. Remove the khachapuri from the oven. Use a spoon to make a 3-in. diameter well in the center of each khachapuri—you’ll need to crack the surface of the cheese to do this.Crack a whole egg into each well. Return the khachapuri to the oven and continue baking until crusts turn deep golden brown, another 6-8 minutes. The egg whites should be fairly opaque but still wobbly, the yolks glistening. (The eggs will continue to cook in the hot cheese after they emerge from the oven.) Serve each khachapuri on an individual plate. To eat: Use your fork to mix the egg thoroughly into the cheese. Cut pieces of crust from the inside rim first, swirling them through the filling like fondue. Then move to the outer rim and the bottom. Serving note: If you like, sprinkle the khachapuri with black or red pepper, smoked paprika, or chopped greens (cilantro, parsley, basil, mint, dill). If you prefer a spicier version, mix some ajika into the cheese while it’s hot. A light salad of cucumber, tomatoes, and red or green onions on the side would complement the rich khachapuri nicely.